The Crystal Ball (1931), Jacques-Henri Lartigue (1894–1931). What do writers and fortune-tellers have in common? To begin with, they both pull stories out of thin air, using mysterious means. They may get a snippet of a scene, a glimpse of a shadowy image, a sense of something, a disconnected feeling. They watch people. Hearing what is not being said, and taking cues from almost undetectable movements. They take these small, random pieces of information, the ones that most people over-look, and they fit them together one at a time; until a story emerges. They then think: where might this end up? For now, I’ll bypass the discussion on the ethics and pitfalls of seeking fame and fortune through such shady means, and….. What? Oh no, I meant the writer. I suppose you could say the same about the fortune-teller. People-watchers have a flair for seeing things that others may not notice. This is a good skill to have for a writer. Which is why you will often see writers sitting in a park, at the mall, out for a walk or planted in a cafe. Usually with pen in hand, laptop at the ready, scribbling on a serviette, or some other means of capturing thoughts. Its part of the writing process. For at those moments we are discovering more about the nature of humans, finding inspiration for our characters and catching germs of ideas for future plots. And what better way to observe others incognito than become a fortune-teller. So this past week-end I dusted off the tarot deck, packed up the signage, dug out the crystal ball and set up an old, wobbly card table at the annual Mind Body and Psychic expo in Adelaide. In the hope of finding some inspiration for my stalled-writing (and having a some fun). And I wasn’t disappointed. Now I am not going to tell any secrets. After all, there is a code of ethics among psychics, even if writers can sometimes be lacking in such morals. However, I will share what I took away from this weekend’s experiences, that on reflection can be applied to writing. To begin with, I learnt that although I still have what it takes, I am not looking at going back in to ‘the business’. I don’t need a crystal ball to tell me that my destiny is to be a writer; and its about time I stopped with the procrastination, excuses and distractions. Setting up shop with the sole intent of collecting material for my novels and short stories would be wrong. Instead, I had to focus on each person and give them the experience they were seeking. And that meant not talking about myself, in any form. While I can tap into the experiences that I have had in my own life, if it helps me to feel empathy for another or provides a clue on how to get through a difficult time, it’s still not ok for me to talk about those experiences. They didn’t sit in that chair to hear me rattle on about myself; they have their own needs. So how does this apply to writing? While it might be appropriate to talk about parts of my life within blog posts, the same cannot be said for novels. While a writer can use the feelings, images and thoughts of past experiences when developing a story, they still need to maintain a certain objectivity. The needs of whoever will read my books comes first, before my need to tell a story. And that story needs to be something new, not an exact replica of my life (unless I ever pen a memoir). Characters may possess certain aspects of the writer, or people the writer may meet in their travels, but they still need to be their own selves; independent of their creator. It’s probably a yearning for something that drives people to seek out a fortune-teller. It could be simply to have your own intuitive findings reaffirmed, or a need to be the focus of someone’s attention for just a moment in time. Everyone wants something: to be heard, to feel loved, to be in the dream job, to have money. I might not be able to give them what they really want, but who am I to shatter dreams? Each and every character in a story wants something, and it’s up to us to figure out just what that is. Then, we need to shift time and space to make that happen or, alternatively, put a few obstacles in their way. Either way moves the story along, helps the characters to grow. However, make sure that some of them get some of their dreams, or readers may feel let down. After all, if a fictional character can’t overcome barriers to reach their goals, then what hope do us mere mortals have? Over those two days, I caught myself using a cliché or two. And, to begin with, I did my best to avoid them all. However, I soon realised that a cliché or two can have a place when talking to others. They are a common language, a strong remedy that is both explanatory and comforting. The people in front of me didn’t cringe when I used one; only my writer-self did. She’s always self-editing, even without a keyboard or pen in sight. So that got me thinking: is it ok to use the odd cliché in writing? I think so. Used sparingly, and at just the right moment, a cliché can add to the story, and bring a sense of normality into the story or dialogue; which is comforting for the reader. The trick is to be stern with yourself, to ensure it is used only when needed, and that you don’t slip into bad habits or lazy writing. Talking of bad habits: the stereotype is a nasty little one. I had to be really tough on myself about this. Unconsciously, we all typecast others, the second that we lay eyes on strangers we are sizing them up, stamping them with a label and putting them in boxes, with a ribbon on top. We may fool ourselves and say that its our intuition talking, that gut-feeling we all know. No, not always. In writing, stereotypes can be found in abundance. Often its lazy writing. Sometimes its bigotry, ignorance and downright offensive. Mostly, it’s caused by relying too much on our own ‘goggles’ (i.e. world-views, beliefs, values, class or positions of power & privilege). And not stepping beyond of our comfort zones, to imagine the world/situation from others’ points of views. However, while its important that we include characters of different genders, demographics, ethnicity, culture and ages, we need to write respectfully, with sensitivity, knowledge and understanding. Even if faced with similar challenges in life, not everyone deals with these situations in the same way. And not everyone comes through the other end in a similar fashion. As uniquely different beings, humans are far too complex to be homogeneous in their journeys through life. Shared backgrounds, education and cultures may create some similarities in coping, but not enough to allow an observer to guess how people will cope when a big load of trouble and grief comes along. You just never know what will make someone (i.e. cause growth, change) or break someone. So when writing character’s responses to the situations you put them through, don’t fall for an average response. That’s not only boring for the reader but is often lazy writing. There are many ways to challenge a character, so don’t pick the average or over-used. And don’t go breaking too many characters; humans are far stronger than what you may think. This is perhaps a flow on from the previous two points. Over the weekend, with all the stories I heard at that expo, sometimes I was surprised. In a good way. For no matter how much a person is thrown during a lifetime, a short span, or a moment in time, both the amount that people can bear and their responses are often surprising. I am sure you have heard true life tales of kindness emerging from horrible situations. Instead of succumbing to a free-for-all, in dark times great lights do shine brightly. Let your characters surprise you. Don’t make them do what you want each and every time. Relax, listen to them for a while. You may be amazed to find out what they want, how they feel, how they react, where they will lead you to. Let them each have their moment to shine. No matter what others may share with you, or the difficult path you see them on, you can’t solve their problems for them, and nor should you try. You can give some well-placed clues or solicited advice, but you can’t make people’s decisions for them. Everyone needs to make their own mistakes. Its good, that is how humans learn. Don’t lecture your characters (or the reader). Don’t hold their hands, or wrap them in cotton wool. Let your characters make mistakes. Big ones. And watch them grow. Everyone lies sometimes; even to themselves. This can be in what they say, or it can be by hiding a part of themselves. That’s ok, we can only share what we are comfortable with sharing; even with ourselves. Some people sat in that chair opposite me, and said that they were open, that they wanted to see the future. However, people rarely expose all of themselves, their secrets. And rarely do people really want to see the truth, the bare story of their lives yet-to-be. They instead want a version of the future, in sugar-coated chunks. In your writing there is no need to share everything, at least not upfront. Let your characters have some secrets. Let them tell untruths to each other, to themselves. As the story unfolds so will the truth. Slowly reposition the mirrors, don’t make them look at their reflection too soon; don’t rush your characters towards a forced acceptance of themselves. And let the smoke be blown away in wavy wisps, a bit at a time as the story unravels. Leave some mystery to the end; or even beyond. Some may be reluctant to get up and leave, wanting more, needing to find out everything that lays ahead of them. So gently, with tact, you need to move them along. You can’t force it, but they need to go. To make room for the next person to take a seat. The session has ended, its done. The expo has come to an end. Its time for them to go back to their everyday lives; perhaps quickly forgetting what they have just heard and seen. With a story you can’t force the ending. Neither can you stop it happening. When its done, it’s over. Save, print/upload: done. It may not be the ending you imagined but its done. Write The Ending. Let go, breathe. And then move on to the next story, the next set of characters. Tricks of the Trade – We all have our tricks, the ones that help us to write. Some are eccentric or even superstitious, some are self-tested and others are borrowed from ‘the experts’. Even though spending 2 days reading the tarot for strangers may seem somewhat odd, it worked for me – this time. Next time I need help with my writing, I am sure I can come up with a new method; perhaps even odder. After all, I am a writer. What do you do to find inspiration? How do you learn more about the craft of writing? Photo description: Gelatin silver print, toned; 23.7 x 30 cm. Born in France on 13 June 1894, Jacques Henri-Lartigue was a photographer and painter whose work included photographs of fashionable Parisian women. 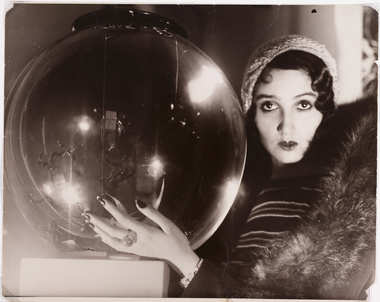 The model in the Crystal Ball was Renee Perle. Renee, a Romanian Jewish woman, moved to Paris where she found fame as one of Lartique’s muses. Thanks to everyone who read this post, and commented. Now that the working week is done, I can sit back and read your comments. And then its time to start fishing around for ideas for the next blog post. And get some editing done, if I am to meet my late June deadline for publishing my first novella. Lucky its a long-weekend! Ah, I love it when IU visitors pop in. Thank you for your kind words. ‘Be prepared to be surprised’ – I love it when my characters surprise me (even if initially I find myself thinking “oh no, don’t do that!”) because it usually means they are taking on a life of their own which is surely the whole point and, besides, if their action/thoughts surprise you as the writer then chances are they will surprise the reader too. Hi Mel. I also love those moments that characters do/say unexpected things. Its as if they come through us, and are not actually created by us; as if they do have a life of their one. Hope they keep surprising you for many many years.